A warning to potential readers who may be lucky to have stumbled upon this book without knowing anything about it: The official synopsis spoils a key element of the plot. The fewer details that one knows of this novel, the more profound its effects. 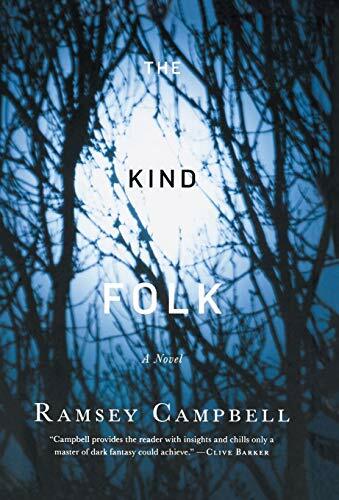 The Kind Folk is the newest release from the UK’s esteemed master of disquiet, Ramsey Campbell—although in point of fact, it’s not exactly new at all. Originally published in limited form in 2012 by PS Publishing, it now has a wide market release by Tor, and deservedly so. This is a definitive showcase of Campbell’s many talents, not the least of which include finding a variety of ways of scaring the living daylights out of the reader. This is the tale of Luke Arnold, a popular stage comedian and soon-to-be father who has recently been dealt an unusual dilemma: His father Maurice has had his family appear on a talk show for a televised DNA test . . . which proves that Luke is not his son. For some time now, Maurice has been suspicious of the peculiar obsession that his brother Terrence has had with Luke, to the point that he suspected Terrence may be his true father. However, the test has proven more than that: Luke isn’t even a blood relative of the entire family—implying that there may have been some kind of mix-up at the hospital when he was born. Luke’s parents are firm with their support of him, insisting that no matter his cuckoo-like origins, he’s their son, and they will love him no matter what. His partner Sophie, a successful singer, is every bit as supportive, trying to remind him that he is who he is, and nothing can change that. Not much later, while performing at a club, Luke receives a phone call from Terence, requesting that Luke come see him at once; but when he arrives, it’s only in time to see his uncle suffer some kind of heart attack and die shortly after. Although in some ways The Kind Folk contains elements that are somewhat typical to a Campbell tale (namely a slow-burn sense of creeping horror lurking ever closer in the background), it’s very much about how one’s own identity can be as much of a source of horror as anything around oneself. Luke’s discoveries begin to affect his entire perspective of his upbringing and identity—and also start taking their toll upon his future. After all, if he’s not even whom he had always thought he was, then who is he? And given his mysterious heritage, what does it all mean for his unborn child? Luke’s career as a stage comedian (especially as one with a knack for doing impressions) brings to mind similar characters in other novels such as The Hungry Moon (1987) and The Grin of the Dark (2008). Yet this is not an act of lazy characterization on Campbell’s part; just as with those novels, it’s very deliberate. As Luke’s reality begins to unravel, he starts positing his talent for impressions as a grim reflection of his lack of identity. The shadow creeping into Luke’s tale is not only internal. From a very early scene onward, there are half-glimpsed figures stalking him, creeping about in trees, peering out from beyond highway partitions, and even lurking in the back aisles of comedy venues. At times, these stalking scenes are reminiscent of similar sequences in Campbell’s 1989 novel Ancient Images, yet injected with such vigor and terror that they are every bit as powerful. “Jump scares” are used so frequently in fiction (as well as film) that readers often find them unimpressive and predictable; this is where Campbell stands far apart from the proverbial pack. He often stages his terrors to hide in plain sight, escalating the terror for both the protagonist and the reader as they come front and center into the narrative. Indeed, in this scene, Luke is opening a set of curtains. It’s a very mundane action, in reality, yet it has to be one of the most unsettling descriptions the act that has probably ever been described in fiction. In some ways, Campbell uses this “all-covering blanket of horror” as a means of cleverly concealing some other surprises in his narrative—namely, his at times disarming knack for humor. Campbell has defined his style as a “comedy of paranoia,” which is also a most fitting description of The Kind Folk. Besides the fact that Luke is a comedian, there are some truly funny and even hilarious scenes in this novel, often accompanied by (or in the middle of) scenes of outright terror, leaving the reader giggling nervously. Totaling only a little more than 200 pages in length and featuring perfectly bite-sized chapters (each bearing an evocative, yet spoiler-free, title that warrants flipping back to fully appreciate), The Kind Folk is written in a lucid (and often disorienting) third-person present tense. Even as the tension mounts and the terrors unfold, the novel’s tempo hardly ever rises to a typical horror frolic; instead, it slowly, casually leads the reader helplessly along an ever-darkening corridor. Campbell’s sensational use of the English language is put to perfect use in this novel, as with all his other works. With scenes of dark comedy, unsettling moods, and diabolical plotting, The Kind Folk is prime Campbell, and is a fine example of his authority in the horror genre.